I am participating in Leslie Saeta’s annual “30 in 30” painting challenge this month. This is my painting for day 2. 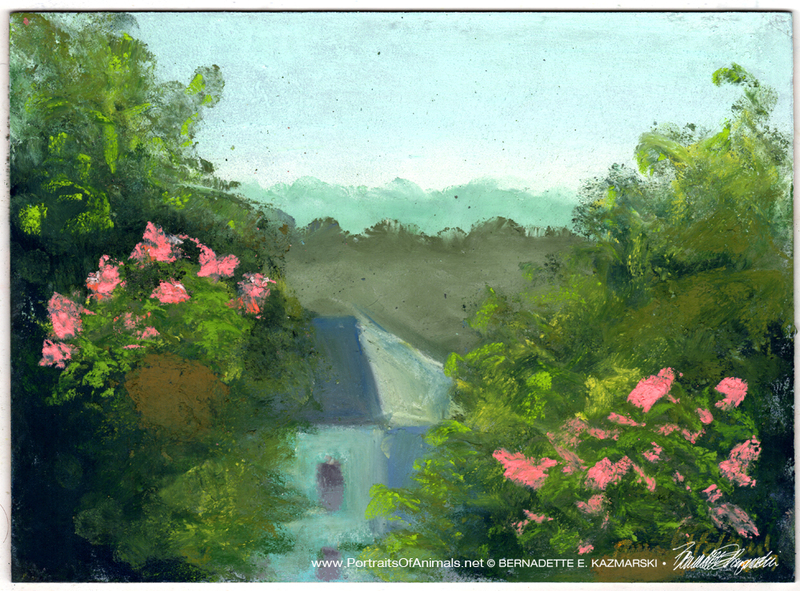 This painting is one of those sweet familiar ones I’ve been wanting to paint for years: an early summer morning, hazy and bright, seen from my deck or through my kitchen window, geraniums in full flower, trees overlapping and heavy with dewy leaves, quiet and still. It’s painted in soft pastel on another self-prepared board. I enjoy these challenges, and I’m looking forward to tomorrow, though I have no idea what it will be. This entry was posted in 30 in 30, landscapes, pastel, Uncategorized and tagged 30 in 30, 30 paintings in 30 days, landscape painting, landscapes, leslie saeta painting challenge, pastel painting on January 4, 2017 by Bernadette.